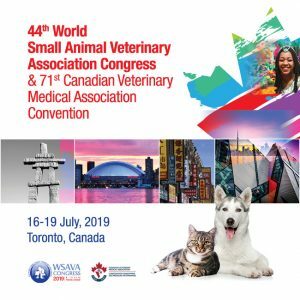 Please find below the promotional toolkit for WSAVA/CVMA 2019, including the official 2019 banners, presentation slides, flyers and other material. We invite you to use the materials to promote WSAVA/CVMA 2019 within your network, on social media platforms, in lectures and meetings. Invite your peers to join you in Toronto! Like us on Facebook, follow us on Twitter & Instagram and join us on LinkedIn to get all news and updates about WSAVA and the Congress. Please post a WSAVA 2019 banner on your website, event calendar and use as your email signature. Use the below text to insert in your newsletters and announcements. We are pleased to invite you to join us in Toronto, Canada on 6-19 July 2019 for the 44th World Small Animal Veterinary Association Congress & 71st Canadian Veterinary Medical Association Convention. WSAVA enables the global veterinary community to meet, to share, and to learn from one another. There will be plenty of opportunities for collaboration and networking, during our highly anticipated social events. Toronto is Canada’s continental gateway and an international crossroad where the world loves to meet. Consistently ranked as one of the world’s most livable cities, Toronto is a global center for business, finance, arts and culture. This city offers the perfect setting to facilitate the enhancement of “one global voice” from the veterinary profession to the world. One of the most multiculturally diverse cities on the planet, you’re destined to have a fabulous time in Toronto.